Item is completely restored with new papercord, frame is checked, cleaned and oiled by our experts. Niels Otto Möller Modell 75 for J.L. Möllers Mobelfabrik. Solid teak frame with black leather. Set of 2. Classic Danish design. Stool Designed by Niels Moller for J.L. Mollers Mobelfabrik Denmark, circa 1960s. 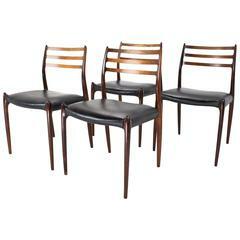 Teak and original cord Measures: 18 ¼” H x 19 ½” W x 14 ½” D x seat 17 ¾” H.
A set of 4 dining chairs in teak with new papercord. Model 83 - designed in 1974 by Niels O. Møller. Produced by J.L.Møller in Denmark. Rare armchair from the 1960s. Manufacturer and designer Niels O. Møller, Model 57. Frame in Teak Webbed seat. Condition: Good, unrestored condition with easy to use pure.